We try to match puppies to suit each family situation so please take the time to talk to us about your expectations and we will help you find that extra special puppy or dog that suits your family and lifestyle best. Breeding dogs is not our liveliehood and we usually will only have one perhaps sometimes two, litters per year. Pet puppies will be available on a non breeding Limited Register Pedigree and unless a co-ownership agreement is reached for a Main Register puppy we do not expect litters back from our pet owning families. We offer a lifetime of support for our puppy families and will take dogs back at any time during their lifetime, so that we can help rehome the dog . Since Mother Nature doesn't always cooperate we do not take deposits until the puppies are safely born, as we don't think it is fair to expect potential owners to pay for a puppy that doesn't yet exist. You are welcome to join our waiting list and we will keep you updated with our plans and arrivals. 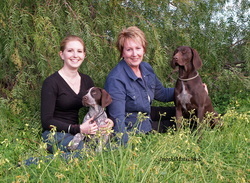 We are also happy to recommend other breeders that we trust to provide a puppy for you.